We were delighted with our newest location for coffee and card this morning. 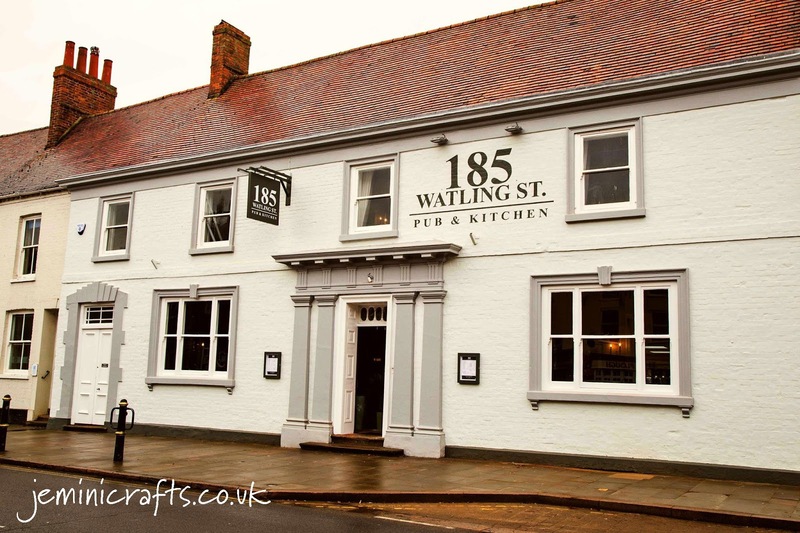 We have moved to 185 Watling Street, Towcester, which is a lovely bar/restaurant in the centre of Towcester. 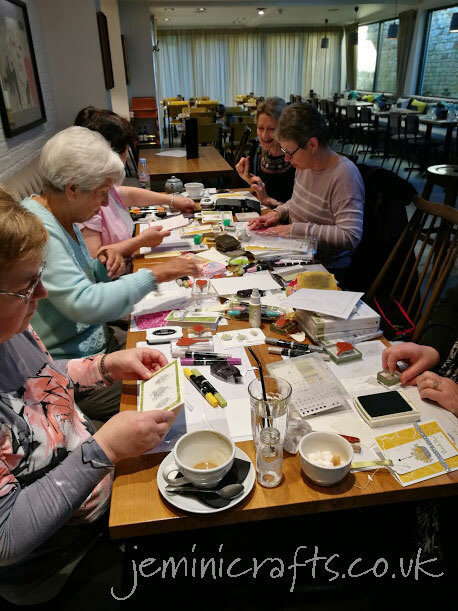 It is a great location for our weekly card making, and I think that it will suit us perfectly, with plenty of room for expansion. Here we are in the midst of our #coffeeandcard session today. You can see the lovely room that we are in - nice and bright and great seating too. Tori, one of the breakfast managers made us very welcome indeed, and we can highly recommend the latte, americano, hot chocolate and tea. In the background you can see the breakfast area - we chose the well lit section which was perfect for our needs. We can seat up to 12 easily. There was a great selection of home made cakes too - and I did have a look at the 'puddings' menu whilst I was there! That will be very tempting for another time. One of the benefits of being in our new location is the free toast! Available until 11:30 each morning, I did say to the ladies that they could only have toast after our crafting sessions - just to avoid butter, jam and crumbs getting onto our cards! Needless to say, some of us just had to try out the toast for ourselves! I did manage to use the cakes as a backdrop to my photograph of our finished designs. The ladies were able to make 2 bookmark cards, or 1 bookmark and a normal card - most opted for the 2 bookmarks. They are so easy, and our Scalloped Tag Topper punch makes a really quick bookmark from any strip of 2" (5cm) card. To see more details and photographs of the cards we made you can visit this previous posting. Stamp your design onto the strip - we used Hanging Garden. Use a background stamp to go around the edges. We used Timeless Textures as there are a great variety of background edges. We then coloured in the designs using our Blends pens - so quick and simple, and really effective colours. We added some ribbon through the top of the bookmark, and secured this with some linen thread, so as not to create too much bulk. We added some background paper to our card, and then a strip of Silver Glimmer paper mounted with Dimensionals for the bookmark to sit behind. To stop the bookmark from falling through the strip, we added a Glitter Enamel dot on a mini dimensional at the base of the card, in the centre. You can see this in the photograph above. 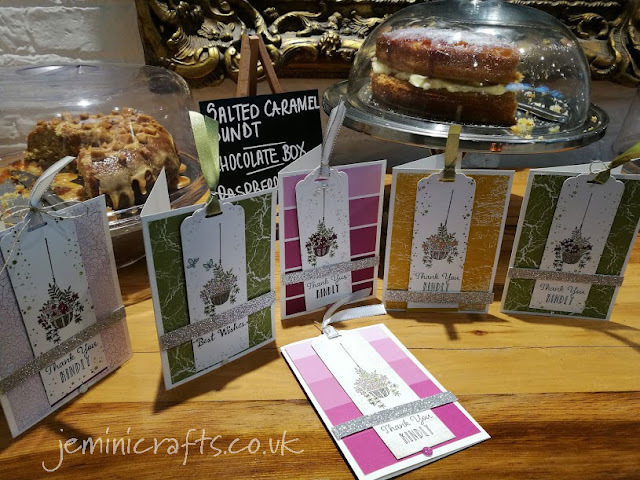 Of course, the enamel dots match the papers we used - a great benefit of Stampin' Up! products. If you would like to join us next week, or any Monday; there is no need to book, just come along to 185 Watling Street, Towcester. Enter through the main doors and keep straight ahead. It is £6 per person, per session, including hot drink and toast, supplies and tuition. All levels welcome. Thanks for visiting today. See you again soon.